Maybe that opening line from Goodfellas, starring Robert DeNiro, Joe Pesci, and Ray Liotta, rings a bell? For me it does, so when Brian Cicioni invited me to join him on his Goodfellas NYC Tour, I was excited to learn more about the real-life stories of the people who inspired the film. I hadn’t seen Goodfellas in many years. The first stop on the tour was along the Gowanus Canal. In the film, this location marked the scene where Jimmy tries to get Karen to check out some stolen dresses after Henry had been released from prison. Brian showed us the scene on his iPad. The street has changed a bit, but the Brooklyn-Queens Expressway and the elevated train line are still there. Henry Hill grew up on Pine Street in the East New York section of Brooklyn. The boyhood scenes were filmed in Astoria, Queens, but Brian took us to the former Hill family homestead just outside the Euclid Ave subway station. He explained how Hill began admiring the local gangsters who socialized near his home. As a teenager, he started working at the Pitkin Avenue Cab Company across the street.. Slowly but surely, Hill began meeting these local mobsters and getting himself into all sorts of trouble related to petty crimes, arson, theft, and more. Nowadays, East New York is no easy place to grow up. The area is still known for its high crime rates, poverty, and widespread drug addiction. After visiting the Brooklyn sites associated with Goodfellas, it was time to explore Queens. Our first stop was Sweet May’s Bakery along the busy Liberty Avenue thoroughfare in South Richmond Hill. Brian introduced us to meet Mavis, who is one of the many Guyanese immigrants who has set up shop in what is now the unofficial Little Guyana of New York. Mavis shared her story of how she ended up in Queens and let us sample some of her cupcakes. We also had a chance to watch her put the finishing touches on one of her artfully designed wedding cakes. This was the one stop on the tour that had no direct connection to the film, but it was interesting to see how one of the neighborhoods that Henry Hill and company once called home has changed over the past 40 years. After stopping by the now-defunct Salerno’s Restaurant, where the double date scenes with Henry, Karen, Tommy, and his “love interest” from Long Island were shot, we headed to our last stop. 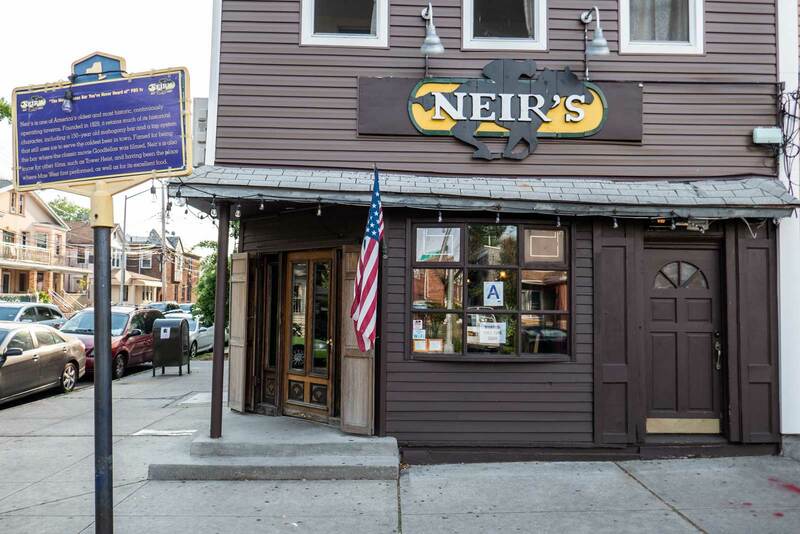 The Christmas party scene (after the Lufthansa heist) was filmed at Neir’s Tavern in Woodhaven, which claims to be the oldest bar in New York City, dating back to 1829. Its walls are covered with Goodfellas memorabilia as well as pictures from a couple other films that shot there. The staff was very welcoming and eager to discuss the rich history of the place. Nicolette was born in the Netherlands to a Dutch father and Polish mother. She graduated from Emerson College in 2010 with a double major in broadcast journalism and organizational & political communication. In November 2014, Nicolette founded #CultureTrav, a Twitter chat that focuses on how travelers personally experience travel, adapting to cultural differences, bridging language gaps, creating new homes as expats, and much more. She is currently based in New York City, where she works as a communications strategist. When she's not working, Nicolette loves to explore her adopted country of the United States as well as her native Europe and the Caribbean. I am surely interested in Goodfella’s NYC tour. I love walking tours and I always prefer Sandeman’s when it’s Europe. Reading your blog, I got similar vibes from Goodfellas. So yes, I am definitely going to book a tour with them when in NYC. This is such a cool tour! I haven’t seen the film for ages, but now will go back and see all the above places mentioned! I would love to do a Goodfellas tour next time I’m in NYC. I think it would be fun to see where the movie was filmed but also explore Queens and other parts of New York outside of Manhattan.